LAHAINA, APRIL 3—The blogger is upset about an incident that occurred this weekend. A simple request was rejected in a very disrespectful manner, insulting not only me but two prominent people standing nearby who were the subject of the request. Most people consider me nice, and I try. to be a person of aloha. and believe I succeed 99 percent of the time. I do not lash out to others. My suspicion is that most people who are not nice never think about being nice.. Never think what is pono, the right thing. And do not realize that a strident question or comment ..even if a legitimate one—can be distressing to a recipient. This is a land of aloha and it can be found everywhere. It is spiritual. It is what sets Hawaii apart from the rest of the world. Remarkable people of aloha is the title of the first selection in my new book. I reprint it here as a reminder of what we should all strive for. The biggest failure along these lines these days are speeches in the election campaign filled with vitriol and nastiness directed at other people. What a role model for youth! We are better than this as a country. “IN HAWAII, WE GREET FRIENDS, loved ones and strangers with ALOHA, which means love.” the great Olympic champion Duke Kahanameka. ALOHA is not an affectation. It is real. Despite the popular bumper sticker, ALOHA is not practiced. It is lived and comes from within. One theory is that the word ‘aloha’ sprung from the missionaries since compassion for others was at the heart of the Christian message. Aloha has within it the word “ha” which means breath in Hawaiian. Even to this day, many Hawaiians greet each with exchange of ha (breath). Impressed with this distinctive way of acknowledging others, missionaries may have incorporated the two letters in a word they believed was at the core of what they wanted to preach. Alo…ha. Still others believe that living aloha was a way of life long before the first tall sailing ship landed on these shores. Either way ALOHA is real . Kahanameka, known as an ambassador of aloha when his Olympic success made him well-known around the nation, went on to say that “Aloha is the key word in the universal spirit of hospitality that makes Hawaii renowned as the world’s center of understanding and fellowship. ALOHA is empathy for others that resides in the heart and it can be acquired naturally. If given a chance. ALOHA can take the form of a smile, a friendly manner or an act of kindness. Growing up in Hawaii in cherished na ohana (family groups) Hawaiians learn ALOHA by example in youth and see it flourish in adulthood. 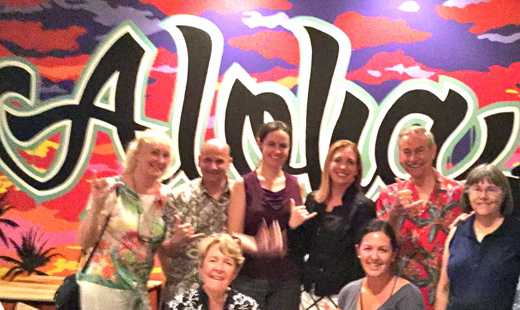 Newcomers can become persons of ALOHA too and many are. ALOHA is an acquired approach to living available to those of us who live here who are passionate about Hawaii, to newcomers, and to visitors who catch the spirit. ALOHA, however, isn’t automatic. There are some Hawaiians (those with Hawaiian blood) who find the concept of ALOHA alien. Pastor Laki Ka’ahumanu is also fond of saying there would be no ALOHA without Hawaiians. The good news is you can find ALOHA without even looking for it. ALOHA is just one of many of the island’s gifts to the world. COMMENTS ARE WELCOME AND WILL BE POSTED HERE AS LONG AS THEY ARE CONSTRUCTIVE. The word aloha is everywhere, a favorite photo subject of the blogger. This is one of my favorites with members of the new Rotary Club of Lahaina Sunset in the foreground, including the blogger. One of the rotary mottos: is it fair to all concerned: Living aloha is being fair.